The Switch has received a plethora of arcade shoot-em-ups since its launch. Naturally, this makes it a lot more difficult for new entries to stand out in the crowd. Black Bird, from developer Onion Games, doesn’t do anything significantly different or necessarily better than its peers, but the game is so wonderfully weird, it’s still well worth a look (even if its £14.99 price tag might be a tad steep for what you’re getting). The plot for Black Bird is very minimal, but from what I could gather, you play as a deceased young girl who, after being left to rot by the general public, transforms into an overlarge egg. This then hatches, giving birth to a the titular black bird. The game refrains from elaborating any further, so you never really find out why the black bird exists, but then it’s not particularly necessary. The gameplay kicks in immediately after the opening cutscene – once the black bird hatches, you’re free to fly around and wreck havoc upon the poor citizens. The levels themselves aren’t particularly difficult, but figuring out how to get the high score certainly is. 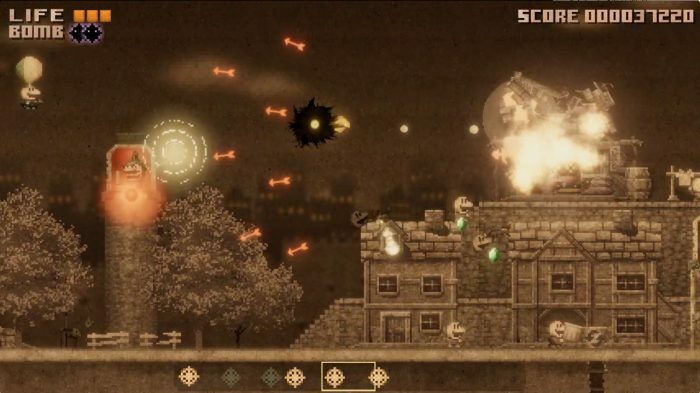 At its core, Black Bird is all about surviving and getting high scores. The levels (of which there are four – yeah, not many), are contained in a similar way to Aqua Kitty DX – so if you fly far enough to the right, you’ll eventually circle right back to where you started. Each level contains a multitude of militia and innocent bystanders to kill, but your main objective is to destroy the stationary defensive armament deployed throughout. Defeat each of these, and you’ll face the end-of-level boss. It can seem overly basic at first, but the more you play, the more depth you uncover, allowing you to alter your play style to rack up the most amount of points possible. By defeating enemies in quick succession, you’ll get a combo bonus to your score. Additionally, killing certain types of enemies unveils a rather special green gem, which shrinks in size the longer you leave it unattended. By collecting these gems, you’ll gradually fill up a circular meter – fill it up completely, and the black bird will grow in size, becoming more monstrous than before whilst getting a significant boost to its weaponry. 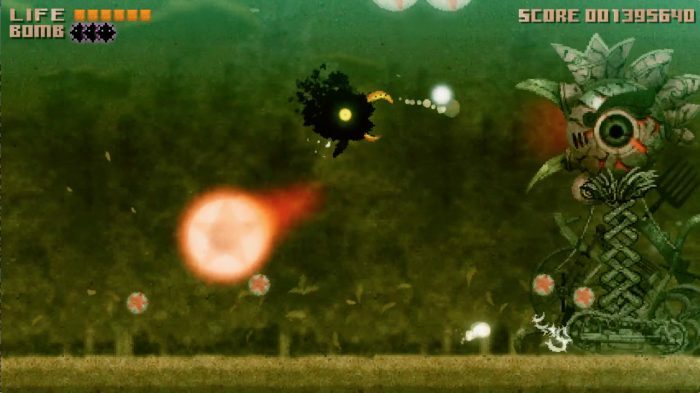 There are plenty of enemies littered around the level, but you’ll need to consider how you take them out if you wish to improve the black bird as quickly as possible. Bird vs Bird: Let them fight. You have two weapons at your disposal throughout the game. Pressing (or holding) A fires your basic weapon, which is basically a bunch of lethal bubbles which grow in size as you improved your bird. If you press X, you’ll unleash a bomb, which immediately incinerates any nearby enemies. Visually, the bomb acts more of a kind of vortex, sucking in anybody unfortunate enough to cross its path. Aesthetically, Black Bird is one of the most unique games I’ve ever played. It’s a 2D pixellated game, but the design is so well thought out, I suspect it’ll become quite timeless a few years down the line. The bosses in particular are quite frankly just bizarre, from a bloated, floating Santa-like gentleman, to a gigantic robotic chicken. Similarly, the music is suitably bonkers, and it almost feels like it actually reacts to your actions in-game, creating a bit of a spin on the rhythm genre. 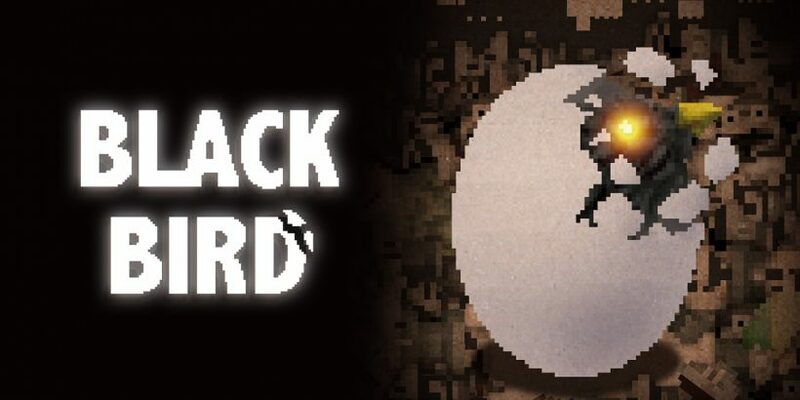 Black Bird’s content is a bit on the slim side for its price, but like all quality shoot-em-ups, there’s significant depth and replay value, meaning you’ll be chasing that high score for hours.